Over the past few weeks the sun has finally been making an appearance, kicking off my favourite time of the year: ice-cream season! Having heard very good things about Paul A Young, I headed to their branch near the Royal Exchange for my first (OK, third) ice-cream of the year. Dark chocolate sauce, slowly solidifying over sweet-salt caramel ice-cream - does it get any better than this? On the day of my visit, there were three flavours on offer - sea salt caramel, white chocolate and cassis, and a 70% dark chocolate sorbet - along with a vat of melted chocolate sauce and cocoa nibs or chocolate balls for sprinkling. I went for the sea salt caramel, and the nice guy at the counter let me do my own toppings (cue a flood of that ridiculously delicious chocolate sauce!) - incredible. 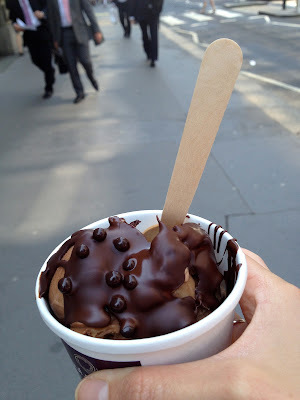 At £4.50 a pop, the ice-creams aren't cheap, but the beautiful combination of sweet, lightly salted caramel ice-cream and glossy, slightly bitter chocolate sauce was well worth it! The flavours were quite intense, which meant that the serving size was probably slightly too large (even for me!). When the ingredients and flavours are this good, you don't need too much, so next time I might share with someone. My Paul A Young experience definitely lived up to my expectations - and the tasting plate of brownie samples means I may be going back for more than the ice-cream.